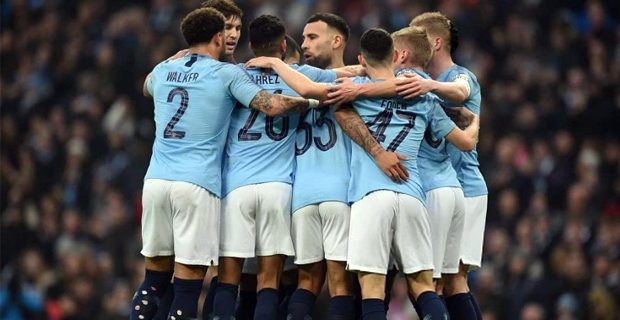 Defending Champions of the English Premier League, Manchester City thrashed Rotherham United 7-0 in the third round of an FA Cup match this morning. City led 3-0 at halftime. Goals for City were scored by Raheem Sterling, Phil Foden, Gabriel Jesus, Riyad Mahrez, Nicolás Otamendi, and Leroy Sane while a Rotherham United player scored an own goal. Meanwhile in the English Premier League matches this Sunday, current League Leaders Liverpool will take on Brighton, Arsenal will play West Ham while Chelsea will take on Newcastle. In the points table Liverpool are in first place with 54 points, defending champions Manchester City are in second place with 50 points while Tottenham is in third place with 48 points.